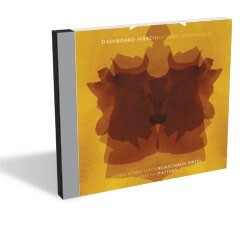 Dashboard Hibachi is the solo project of Jedd Kettler, who is best known as one-third of the experimental folk-rock band farm. Kettler and his fellow farmhands, Joshua Givens and Ben Maddox, have spent most Saturday nights over the past several years writing and recording songs down in the basement of Maddox’s Enosburg Falls coffee and record shop, the Flying Disc. Each has learned to play a variety of instruments, from bass, drums and guitar to keyboards, percussion and fiddle, to fill in all the colors on their three full-length albums: Gray Birds, The Cave and Sat., Cloudy, Calm, 36º F, 10:44 p.m.
Those years of woodshedding and home recording have served Kettler well. He released two new EPs, Rorschach Dress Pattern and Guzen Type, earlier this year. And there’s good news for farm fans: Kettler’s apples haven’t fallen far from the tree. Most of these songs sound like farm outtakes. Several stand side-by-side with the band’s best work. Rorschach opener “Stars Are Cold” begins with a wordless, three-part harmony before a distorted loop and drums-and-handclap percussion set up Kettler’s first couplet: “When you’re down, you try to see a light in it / when you’re up, you always expect loss in it.” The chorus, on which Kettler harmonizes with himself singing the words “Stars are cold,” is stark, chilly and somehow — like much of Kettler’s music — very northern. Northern Gothic, even. Kettler follows the murky crunch of “Stars Are Cold” with the plaintive beauty of “The Lions Were Hungry.” Over a simple waltz of strummed acoustic guitar, bells and faint bass drum, Kettler sings variations on the lines “When lions get hungry / they do things that we wish they wouldn’t do.” It’s wistful, like a love song of regret. And it works. After the opener, Guzen Type gets experimental, with loops, distortion, obscure instruments and longer instrumental passages. At times, it’s easy to imagine “Stare at the Drifts” being used as mood music in an art-house flick. “Built to Wood Smoke” has a dreamy, late-winter-day vibe courtesy of impressionistic lyrics about woodpiles and layers of electric guitar brightened with digital delay. A new farm album is always in the works — the band is prolific — but these two EPs under the name Dashboard Hibachi provide a reminder that Jedd Kettler is just as good working alone in his house as he is with his two buddies over in Enosburg Falls. Let’s hope he keeps at it. Dashboard Hibachi plays Charlie O’s in Montpelier this Friday, July 27, with Nuda Veritas and Mouthbreather, the latter a side project of farm’s Ben Maddox.